That’s the fundamental takeaway from Broome’s press release attacking the group attempting to incorporate the new city in East Baton Rouge Parish cobbled together from unincorporated areas in the parish’s southern regions. The St. George organizers had put out a prospective budget based on an independent study showing it would run a surplus of $20-25 million based on current government revenue generated in the areas to be incorporated. Broome’s numbers put out yesterday disagree. Except not to the extent she might have wanted. Mayor Sharon Weston Broome’s administration went on the offensive today for the first time against the St. George incorporation effort, releasing data that suggests St. George organizers are off by nearly $14 million in the amount of sales tax revenue they estimate their city will collect in its first year as an independent municipality. 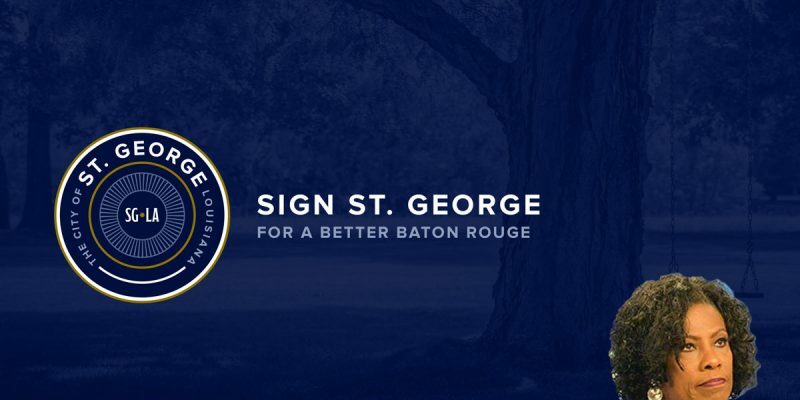 St. George organizers have said they believe their new city would collect an estimated $53.4 million in sales tax revenues in their first year, according to a budget released in March and prepared by the Metairie CPA firm Carr, Riggs & Ingram. Those revenue estimates appear to be based on a percentage of the parish’s overall sales tax collection, according to the Broome administration. By comparison, the administration’s analysis lists a spreadsheet of all 6,500 businesses that exist on paper in the proposed St. George city and discounts those that are inactive or do not pay sales taxes, leaving just slightly more than 2,100. An additional 1,540 or so businesses in the proposed city pay occupational license fees only, which would also be a source of revenue, though a relatively small one. Organizers of the St. George effort could not be reached for comment prior to deadline. The St. George budget projects about $34 million in expenditures, and about $5 million in non-sales tax revenues – so all told about $58 million in revenues. And Broome is saying the sales tax revenue figure is more like $39 million, so a $44 million total revenue take. Which means she’s admitting St. George could be in the black by $10 million per year if their expense budget is correct, and she hasn’t challenged that in any material way that we’ve seen. This is the kind of press release you don’t send out if you know what you’re doing. Which wouldn’t be a fitting description of Broome – who is rapidly becoming the ace in the hole for the St. George organizers.